A vibrant chronicle of one of today's most notorious and revered live bands, Gogol Bordello Non-Stop follows Eugene Hutz's gypsy-punk brigade around the world as they spread their liberating libertine musical gospel. Filmmaker Margarita Jimeno tracks their raucous gigs from 2001 to 2006, from NYC to Italy, as the band rises from dingy basements to festival main-stages. The cast is a rotating circus of polyglot personalities from Israel, Russia and America, who dish on their music, their heritage, and their favored vices. Hutz, a sardonic mustachioed Ukrainian immigrant and the group ringleader, fuses his gypsy heritage with a love of punk rock and burlesque. Part carnival barker, social organizer, and poet, he's a mesmerizing presence on-stage and off. 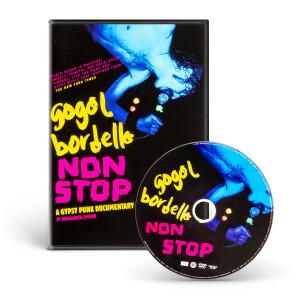 Gogol Bordello Non-Stop is an artful documentary that mixes flamboyant costumes, intricate dance choreography, a relentless beat and an explosive energy not seen since the dawn of rock 'n' roll.